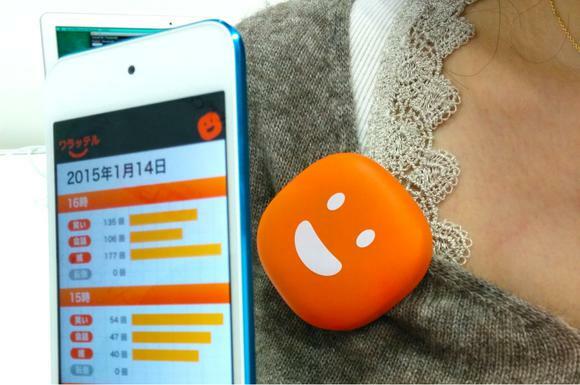 If you think you saw all the wacky or questionable wearables at CES earlier this month, Japan still has a few more up its sleeve. At the first Wearable Device Technology Expo in Tokyo this week, Google Glass-style head-mounted displays for workplace applications dominated. But a few exhibitors aired concepts that came out of left field. WaratTell is a sensor that’s based on 10 years of “laugh-detecting technology”—but it’s no joke. 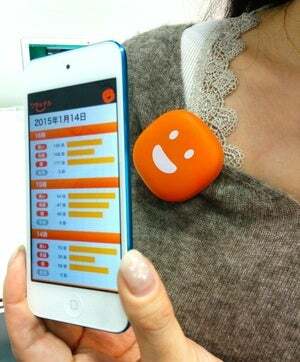 Developed by Masafumi Matsumura of Osaka Electro-Communication University, the prototype can tell when you’re laughing, talking or coughing, as well as whether you’ve fallen down and can’t get up. The WaratTell laugh sensor, shown off at the first Wearable Device Technology Expo in Tokyo this week, monitors how often seniors laugh, talk, cough or fall down. The target users are elderly people living apart from their loved ones. If they’re too busy to pick up a phone and call, family members can monitor how happy seniors are via an Internet connection and an app that shows how often they chuckle or if they’re in distress. During a demo, audio-processing software linked to the sensor automatically distinguished between vocal sounds such as a cough or a guffaw. Equipped with a microphone, Bluetooth and Wi-Fi modules and an accelerometer, WaratTell is housed in a bright orange casing adorned, appropriately enough, with a smiley face. It clips to a lapel or hangs around a user’s neck. There are other wearable monitors for seniors already on the market, such as AT&T’s EverThere, but they mostly focus on tracking movement and not emotion, according to the developers. The firm is testing the waters with the laugh detector and hopes to release it this year if there’s enough interest. It could eventually sell for ¥10,000 ($85) to ¥20,000. 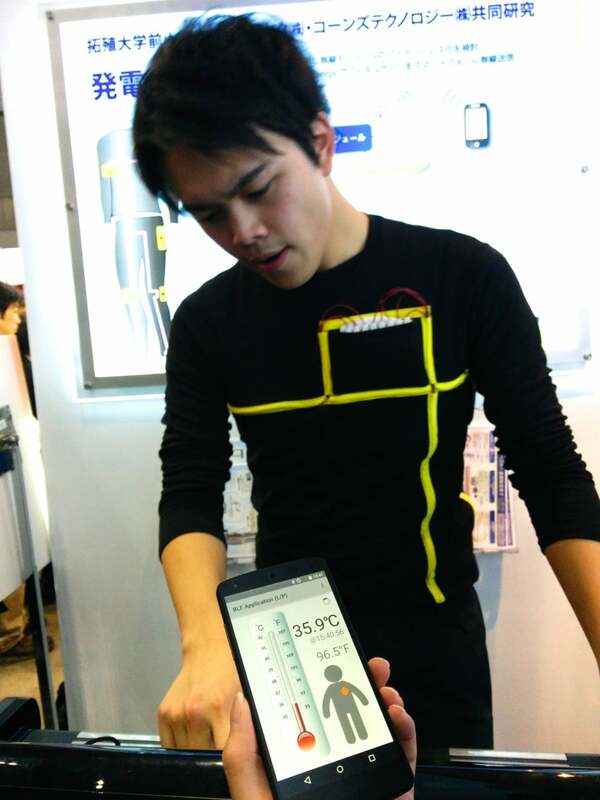 This power generation suit, shown off at the first Wearable Device Technology Expo in Tokyo this week, contains eight piezoelectric patches to generate electricity. But don't count on it charging your iPhone -- it's only strong enough to power a temperature sensor and Bluetooth module. Another device being tried out at the expo was a “power generation suit” developed by electronics distributor Cornes Technologies. It incorporates eight flexible piezoelectric polymer patches sewn into the knees, hips and other areas, as well as a capacitor in the chest area. When a person moves around, the patches generate current. While you might think that charging your iPhone just by wearing something would be nifty and convenient, the suit only generates about 1 milliwatt. That’s only enough to power a temperature sensor in the chest and a Bluetooth signal to a linked smartphone, which can display the temperature on an app. “This is a proof of concept device,” said Takaya Ukai, a University of Tokyo graduate student and Cornes intern who was working up a sweat on a treadmill while wearing the electric outfit, which looks like a regular track suit. Cornes wants to pitch the piezoelectric patches to other manufacturers. Many Japanese companies have been focused on the next few years because of the 2020 Olympic Games, which Tokyo will host. The expected influx of visitors has caused companies like mobile carrier NTT DoCoMo to roll out Japanese translation apps for smartphones that are more sophisticated than Google Translate. Kobe Digital Labo, though, has a different approach. At the wearables expo, it was showing off a smartglasses app called WearAssist that, among other functions, recognizes Japanese text on a restaurant menu and offers English translations. Demoed on a pair of Epson Moverio smartglasses, it displays options such as “soba noodles” in basic green text. Touching a linked smartphone calls up more information on the dish. The problem with the concept is that it presupposes that Olympics-going tourists will be sporting Google Glass or other head-mounted displays in five years. It also requires the target text to be registered in the app beforehand. Asking for help with a foreign menu the old-fashioned way, through basic conversation, seems far easier. “We would like to implement this during the Olympics but the data has to be input first,” said Makiko Kawamura of Kobe Digital Labo, a website development and IT consulting firm. If anything the expo—which has drawn thousands of people to Tokyo Big Sight—has shown that if wearables are going to get off the ground, they’ll have to make life easier, not more complex, and not try to meet a need where they may not be one in the first place.